Your letter to your constitutent in Washington State is in error with respect to the natural born status of Barack Hussein Obama. 1. All persons born or naturalized in the United States, and subject to the jurisdiction thereof, are citizens of the United States and of the State wherein they reside. What could be clearer than that statement from Obama's own website? You should also note that nowhere in Amendment 14 do the words "natural born" appear. 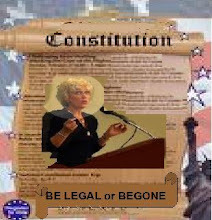 The Amendment is very careful to stay away from the term "natural born" as any change to Article II, Section 1 of the United States Constitution requires an Amendment to the Constitution which has been rejected many times. "Permit me to hint whether it would not be wise and seasonable to provide a strong check to the admission of foreigners into the administration of our national government ; and to declare expressly that the command in chief of the American army shall not be given to, nor devolve on any but a natural born citizen." The statement, "and subject to the jurisdiction thereof" was previously written as, "of parents not owing allegiance to any foreign sovereignty..." Both mean the same thing. I would hope sir that you will study the issue carefully and make a correction to your constituent. In addition, on January 8, 2009 when Congress meets to validate the vote of the Electorial College, I would hope you would rise and in unison with other Congressmen (meaning Senators as well) request that Vice President Cheney suspend the vote pending a full and complete hearing as to the eligibility of Barack Hussein Obama to be President of the United States. Barack Hussein Obama does not meet the requirements to be President of the United States as defined in Article II, Section 1 of the United States Constitution!